Størrelse på denne forhåndsvisningen: 800 × 532 piksler. Andre oppløsninger: 320 × 213 piksler | 640 × 426 piksler | 1 024 × 681 piksler | 1 280 × 851 piksler | 3 008 × 2 000 piksler. Long Beach, Mississippi, September 6, 2005 -- Destroyed businesses and municipal buildings on Jeff Davis Avenue in Long Beach, Mississippi from Hurricane Katrina (Long Beach is west of Gulfport and east of Pass Christian.) 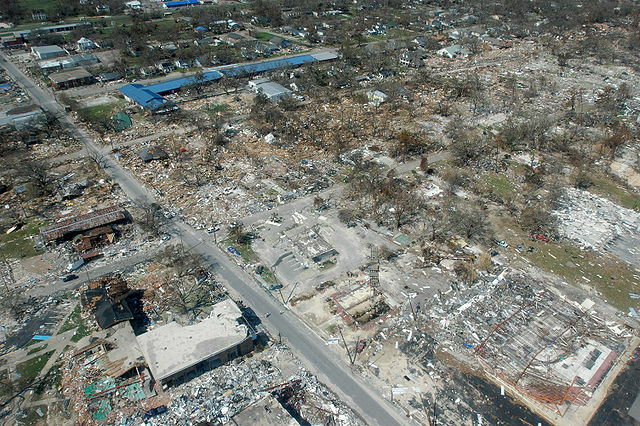 This photo shows the street at an angle but Jeff Davis actually runs North (upper left edge of the picture) to South (lower right) with the South part of the street at the photo's edge being approximately 200 yards from the Gulf of Mexico to approximately half-a-mile from the Gulf on the North end. The long, blue building is Harper McCaughan Elementary School, which appears to be shifted off of its foundation. To the north of that is Long Beach Public Library, with Long Beach City Hall to the north of the library. Although these building appear to be standing, upon closer inspection, they were heavily damaged and most had to be destroyed and re-built or re-located. The East-West streets showing are (going north) 5th Street, 4th St., and 3rd St. (the school and library intersection), 2nd St., then a little of the railroad tracks. There used to be as many houses on 4th and 5th streets as on 3rd St. and all the roads used to have a heavy cover of trees. The debris piles do not show very much in this photo because a lot of debris had been cleared from the area during the week between when the storm hit and this photo was taken, but the water-line debris piles created by the storm surge were at least 10-15 feet high in places (the debris line is more noticeable if you look at the roofs of the buildings.) Many of the businesses never came back but the City of Long Beach has done a very nice job of rebuilding the street much nicer than it was before. The area in this photo is a fairly low-lying area. Hurricane Katrina caused extensive damage all along the Mississippi Gulf Coast with Waveland, Mississippi taking the strongest hit of the entire storm as it was right along the Northeast edge of the eye wall where the strongest winds of a hurricane reside. The section of Long Beach north of the railroad tracks is making a very speedy recovery, thanks to the diligence of City workers and all of the many volunteers in the area. The outpouring of support from all over the country has been incredible and greatly appreciated. The section of Long Beach south of the tracks is a different story, although debris removal is coming along and a very few people have moved back into their homes. All (but one) of the people on Highway 90 lost their homes completely (gone with no trace), almost all on 5th and 4th streets have lost their homes completely, and most of the homes on 2nd and 3rd streets are heavily damaged, either by wind or by water. Most did not have flood insurance, except on Highway 90. This image is from the FEMA Photo Library.